On Nov 1, 2015, I tried to upgrade my laptop to Windows 10. This was a bad experience, when it had upgraded I didn’t have a start menu or an App Store, so I reverted back. 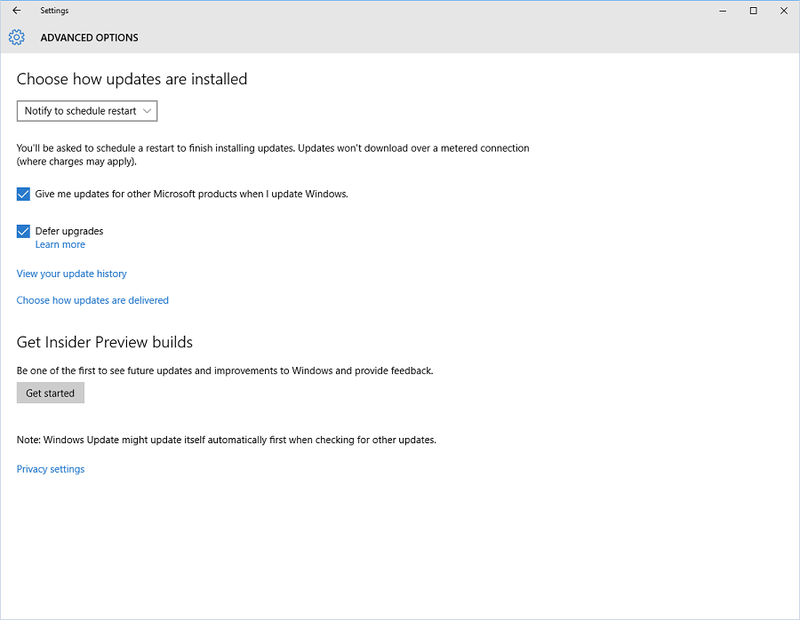 See this link to the original article about my Windows 10 upgrade experience. I wasn’t very happy at the end of it, and had my usual rant about about Microsoft and software in general, in that you should have confidence in your own software design, screen layouts and ubiquitous language, and certainly not focus on your competitors to the detriment of your own product. Apart from this ongoing gripe with Microsoft, they have come a long day since the days of .NET 1.1 and datasets, and I like their products, Windows 10 apart, a lot. Maybe the Gu should take control of Windows10 and bang a few heads together who knows? Giving Windows 10 Another Try? As a screen space junkie, I wanted the multiple screens on Windows 10, even though my laptop is high res. anyway, and on my desktops I have two 4k screens. Although I don’t tend to go for latest versions too soon, as a developer its important to know about the latest technology especially if its going to affect you or your clients at some point. So I decided to give it another try. I got the same laptop, which hasn’t really been used since then, ran Windows Update and tried again. This time around I did the same things, but it took a lot longer to upgrade (was it because I had installed SQL/Server 2014 and Visual Studio 2015 on it… maybe…). But importantly this time around it was smooth. Everything worked as expected and apart from a few settings which I feel are good for developers, its all working fine without problems of any sort. Using the Windows key and then tab, or Windows and CTRL and left or right arrow, or Windows and D – all are used for different things on the multi screen features of Windows 10. A nice bonus that I didn’t know about in advance was that you can now use two fingers on the mouse to scroll, although not as smooth as on my Macbook Air, it works (so Windows can now do multi-touch – I assumed that was something that Steve Jobs had patented early on in his second stint at Apple – interesting). I’m not really a Windows geek, my head is too full of developer thinking and C# to worry too much about the operating system, I would have been happy with Windows 7 with multi screen, but so far so good anyway. Turned off User Account Control. Not sure if this is the same as in Windows 7 but I’ll keep an eye on that when using Visual Studio. Checked my settings in Control Panel to check that Show Hidden Files and Hide Extensions for Known types are set as I like – the Windows 10 installation did not change these. Disabled Windows Defender real time scanning in the group policy editor. Developers, who don’t use email on a machine, don’t need all this stuff turned on. Disabled automatic drive optimisation (defrag) because my laptop uses dual Samsung SSD’s and its not recommended to optimise SSD’s. It did recognise these as SSD’s but doesn’t do anything it just says “Optimisation not available” so rather than have it run pointlessly, as I have no hard drives, just SSD’s, I disabled the weekly optimisation step because I don’t ever want my PC to waste processor clock cycles on doing stuff that it shouldn’t. Anything that makes Visual Studio compiles not instantly fast, even on the large projects I work on, is BAD. The benefit of using Group Policy Editor for Windows Defender is that it stays off. Windows 10 will re-enable it if you turn it off by going into Windows Defender – very annoying! Turn off real-time protection Enabled. Monitor file and program activity on your computer. Disabled. I’ll do that myself thanks. The Microsoft Windows Team needs to add a big developer button to Windows 10 that dumbs down all this consumer crap and puts a Visual Studio 2015 icon on the desktop for devs. So maybe we should send the Gu round to the Windows 10 team to bang a few heads! Anyway, on the whole, so far so good. I’ll blog again if there is anything further to add about Windows 10 when using it as developer with Visual Studio 2015. ASP.NET 5 is Ten Times Faster?